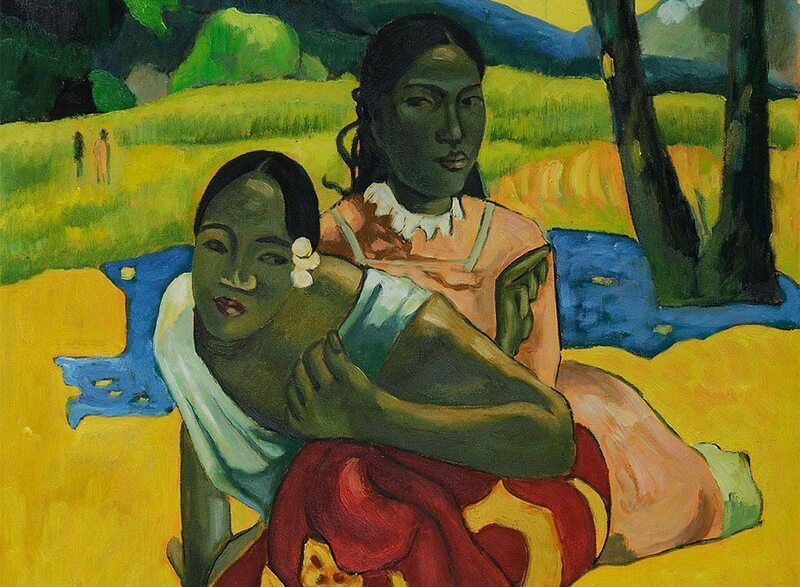 Paul Gauguin’s painting, Nafea Faa Ipoipo (When Will You Marry? ), has been most discussed recently as becoming the most expensive artwork ever, selling for nearly $300 million in 2015. Gauguin (1848-1903) was not a particularly popular artist while he was alive, and it was only after his death at the age of fifty-four when his talent was fully recognized. His artwork is distinguishable by its bold experimentation with color and synthetist style. Gauguin is considered to have a major influence on the French avant-garde as well as twentieth-century artists such as Pablo Picasso, Joan Miró and Henri Matisse. The painting is colorful, a combination of vibrant yellows, blues, reds and greens. Two Tahitian women sit on the ground, a diverse landscape of trees, water and mountains behind them. They look in different directions, though neither appears to look at the viewer. The figure of the woman in the foreground is dynamic: she is resting on one hand while leaning forward in a crouch, seemingly about to rise and leave the scene. Her eyes look toward the woman behind her in a sidelong glance, the slight pout in her mouth suggesting some sort of conflict between the two. Her free flowing garments embody a spirit of liberation the artist sees in Tahitian culture. On the other hand, the woman in the background represents the antithesis of this culture. Sitting upright, her pose prim and proper, her clothes distinctly western in style with a conservative neckline, she too glances at her companion from the corner of her eyes with an expression of condescension and disapproval. While the first woman’s attire causes her to harmonize seamlessly with the natural landscape behind her, the latter woman’s garments cause her to stand out, striking discord in the scenery. Behind them, in the distance, two figures stand, though it is unclear who they are, if they are men, or if they are waiting for the women. In the contrast between the two women, a clash of cultures can be seen: the woman in the background seems to bring traditional western values of the nineteenth century to Tahiti, while the other woman provides an idealistic vision of a free-spirited Tahiti, unshackled by the mentality of a woman as a homemaker that commonly marked western society in the past. The white daisy on one girl’s hair may well symbolize that she is in the prime years of her youth, ripe for marriage, and so the other woman, her hand raised to admonish the former, asks “when will you marry?” The girl, unwilling to abandon her freedom, rises to leave and escape the burdensome responsibility placed upon her, though perhaps the figures in the background are men who represent that this will haunt the girl and one day become her reality. The Tahitian woman in western clothing is placed at the center of the painting, showing that though her presence may be jarring, it is no doubt central to Tahiti. An ominous cloud looms over the beauty of Tahiti’s own culture: an impending storm of colonialism threatening to consume the land, hidden under the guise of a ceremony entitled marriage. Nafea Faa IpoipoPaul GauguinpixellecoRachel FarberSarah WangsynthetismWhen Will You Marry? This is such an interesting interpretation. I really like the duality in this painting.